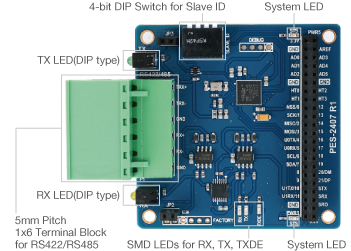 PHPoC Smart Expansion Boards provide the additional hardware and firmware to boost PHPoC IoT board with the advanced capabilities (e.g. control high-voltage devices, control/monitor motors with high accuracy). 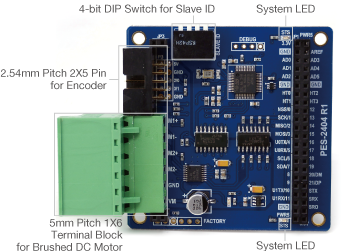 Smart Expansion Boards communicate with PHPoC Black/Blue as master and slave way via a definite set of commands, through a specific port. 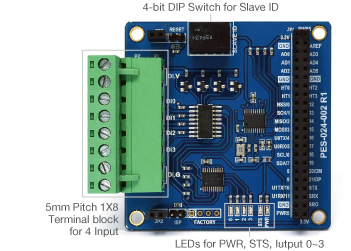 A smart expansion board is stackable on PHPoC IoT Board and specified by a slave ID number among 14 different ID numbers available, which can be set by a DIP switch. 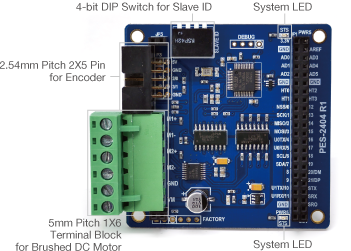 A single PHPoC Blue or Black can carry multiple smart expansion boards, in which the types of these boards can be the same of different. 4-port Relay Board is a PHPoC smart expansion board, which is designed to control on/off high-voltage devices. By stacking on PHPoC Blue or Black, this board can be controlled by PHPoC Blue/Black via a definite set of commands, through a specific port. Each 4-port Relay Board carries four relays. A single PHPoC Blue or Black can carry multiple 4-port Relay Boards. Two different types of terminal blocks are available, based on the direction of the terminal screws. S-type can be screwed from the side, convenient when the multiple boards are stacked. T-type is screwed from the top of the board. The wire termination blocks are on the side of the board in both models. 4-Port Digital Input Board is a PHPoC smart expansion board, which is designed to monitor on/off state of high-voltage devices. By stacking on PHPoC Blue or Black, this board can be controlled by PHPoC Blue/Black via a definite set of commands, through a specific port. Each 4-Port Digital Input Board carries four photocouplers. 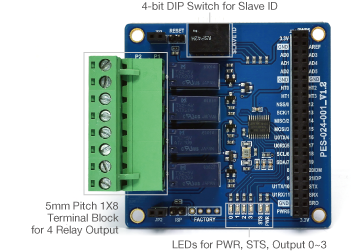 A single PHPoC Blue or Black can carry multiple 4-Port Digital Input Boards. 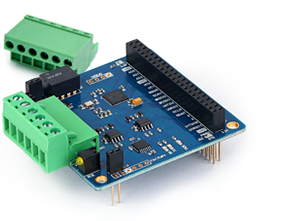 Stepper Motor Controller is a PHPoC smart expansion board, which is designed to control a step motor. By stacking on PHPoC Blue or Black, this board can be controlled by PHPoC Blue/Black via a definite set of commands, through a specific port. Each Stepper Motor Controller contains necessary hardware and firmware to control a step motor. 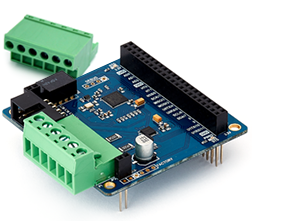 A single PHPoC Blue or Black can carry multiple Stepper Motor Controllers. DC Motor Controller is a PHPoC smart expansion board, which is designed to control Brushed DC motors. By stacking on PHPoC Blue or Black, this board can be controlled by PHPoC Blue/Black via a definite set of commands, through a specific port. Each DC Motor Controller contains necessary hardware and firmware to control up to 2 DC motors. 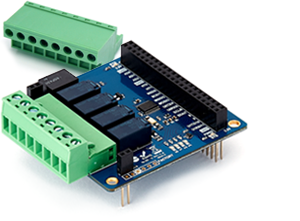 A single PHPoC Blue or Black can carry multiple DC Motor Controllers. 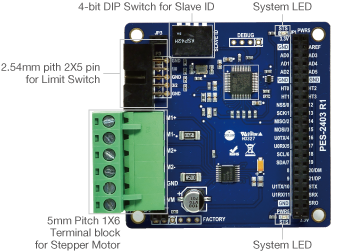 Stepper Motor Controller II is a PHPoC smart expansion board, which is designed to smoothly and precisely control a step motor using micro-stepping method. By stacking on PHPoC Blue or Black, this board can be controlled by PHPoC Blue/Black via a definite set of commands, through a specific port. Each Stepper Motor Controller II contains necessary hardware and firmware to control a stepping motor. A single PHPoC Blue or Black can carry multiple Stepper Motor Controller II. Smart RS232 board is a smart expansion board for PHPoC boards. It is designed to quickly enable and easily expand the capacity of RS232 communication function on PHPoC Blue or Black. 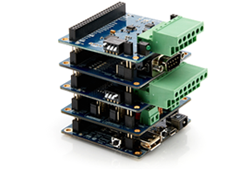 Each Smart RS232 Board contains necessary hardware and firmware to communicate with RS-232 devices. 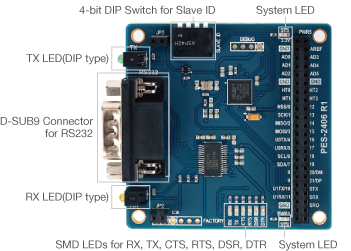 A single PHPoC Blue or Black can carry multiple Smart RS232 Boards. 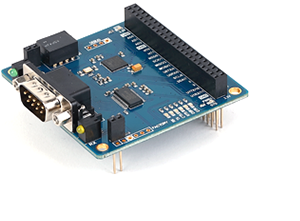 Smart RS422/RS485 board is a smart expansion board for PHPoC boards. It is designed to quickly enable and easily expand the capacity of RS422/RS485 communication function on PHPoC Blue or Black. Each Smart RS422/RS485 Board contains necessary hardware and firmware to communicate with RS422/RS485 devices. 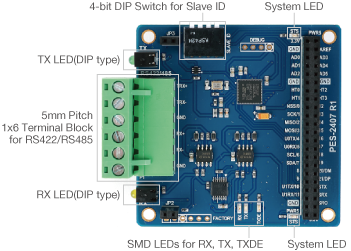 A single PHPoC Blue or Black can carry multiple Smart RS422/RS485 Boards.